Welcome & thanks for stopping by! If you're new here, I'm a Toronto-based blogger with a fondness for traditional architecture, transitional style, and plaid who loves to fix up her new old house, one DIY at a time. Check out more of our home here. 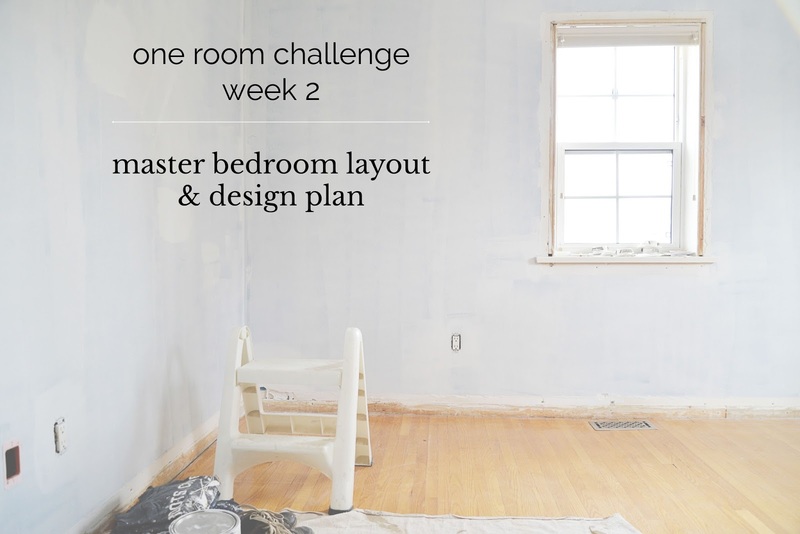 It's Week 2 of the One Room Challenge, hosted by Linda at Calling It Home and media partner House Beautiful and our house is covered in dust and paint fumes as we work our way towards a calm and neutral master bedroom. I shared a video of Week 1's DIY adventures on my Facebook page and we're off to a good start. The window and door trims have been removed and we've got primer on the walls. But where do we hope to end up? 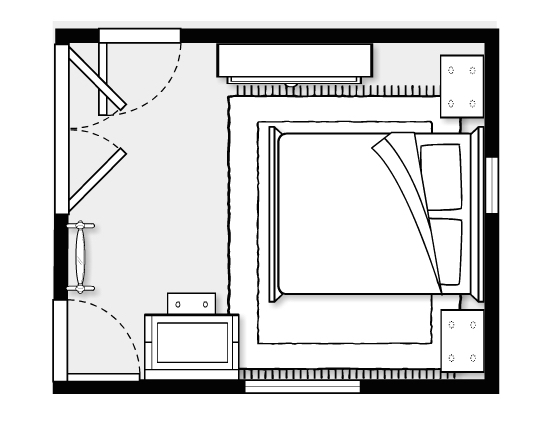 Time to show you the layout and design plan. While this option would give us plenty of space near the foot of the bed, it would make walking around the furniture really awkward. We'd have barely enough room to open dresser drawers. Additionally, I didn't like the idea of one small narrow window behind our large and tall headboard. This option would give us a more spacious layout. We'd have our wide dresser against the wall allowing for artwork and display above. 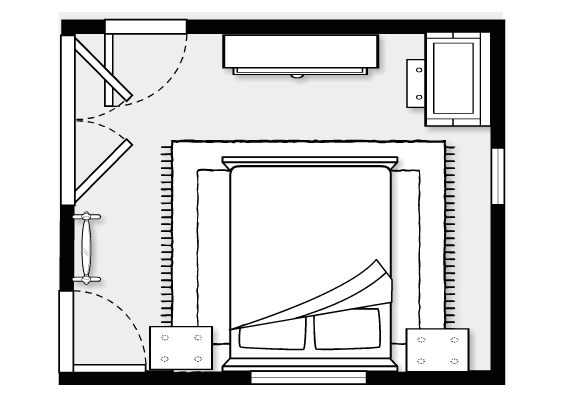 As well, the bed and nightstands would be facing you as you entered the room, giving a sense of symmetry and order. The major drawback of course would be our large headboard would be placed in front of the largest window, blocking off light. Note to self: next time, decide on your bedroom layout before you buy a bed! We decided to go with Option 2. While I am worried it might make the room feel darker, I think the room will feel more logically laid out. And we can always move things around if it doesn't! With the layout decided, it was time to figure out the design plan. Our style has always leaned towards the traditional. We loved our previous master bedroom and wanted this one to achieve the same balance of neutral serenity and architectural interest. 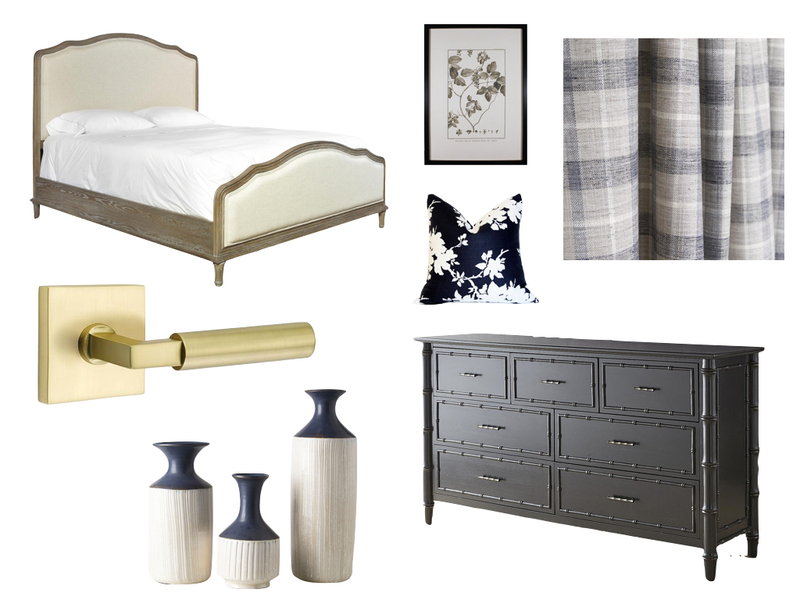 Our old master bedroom landed me on The Nate Berkus Show (he loved the moulding treatment behind the bed which, in 2010, felt new and novel) so I feel a certain pressure to make this bedroom just as memorable. For me, a good design plan starts with the foundation: the walls, doors and windows, and moulding. This bedroom has a crazy coved ceiling which makes it difficult to decide where to start and stop paint treatments. So, we're taking a trick from our old bedroom and painting everything - walls, doors, window trim, and ceiling - the same colour. The effect is a calm, cozy room which envelops you and you don't notice the architectural peculiarities. I was thrilled to work with Farrow and Ball for our last ORC project (the Ammonite colour really accentuated all of the moulding) and will be working with them on this makeover. 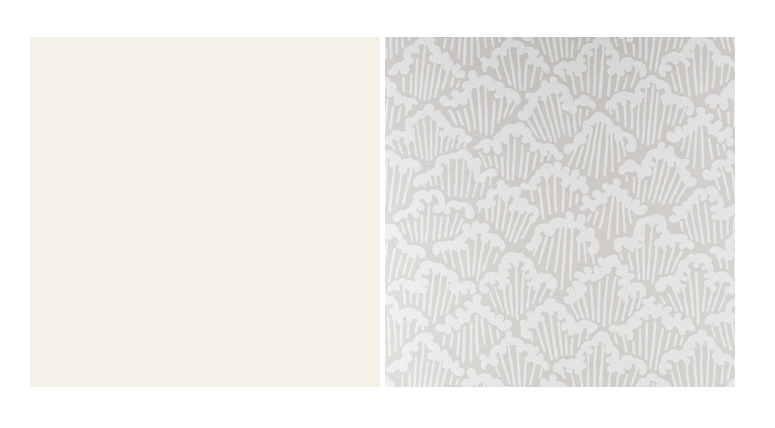 I decided on Wimborne White, a white that's neither too cool nor too warm. To add some interest, we'll be putting Aranami Wallpaper on the solid wall. It has a bit of an organic, Japanese feel and I think it will bring subtle pattern to the design. The doors will be replaced with the Masonite Expo Heritage Series Logan door, a clean-lined and simple shaker panel door. We're also replacing the bifold doors on the closet with two larger passage doors. The one issue with this change is that the right side closet door will swing into the entry door so you can never have those two doors open at the same time. It's not a big issue - I never really change my clothes when the bedroom door is open anyways, ha! 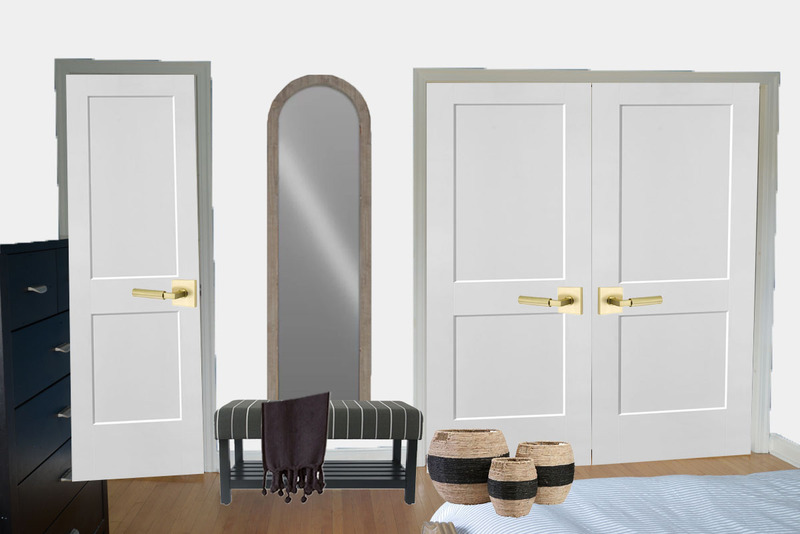 The door levers will be the Hercules Lever in Satin Brass with Square Rosette from Emtek, another fabulous ORC sponsor. I just received the levers (check my Insta-stories for a sneak peek!) and they are weighty, substantial, and feel really good in your hands - my three must haves for door hardware! I picked the square rosette to work with the square lines of the door. The doors aren't on site yet so let's hope it all works together! Moulding is an essential element to creating a room with character. Slowly, room by room, we're changing the existing trim work in this home to moulding that is more substantial. We're using the same trim pieces in this room as we did in our living room, 2/3" casing for the windows and 3 1/2" casing around the doors. As the bedroom didn't need to be as "grand" as the living room, we opted not to do architraves above the windows and doors and went with a slightly shorter 5 1/2" baseboard. Most of the pieces come from Metrie's Very Square II collection. 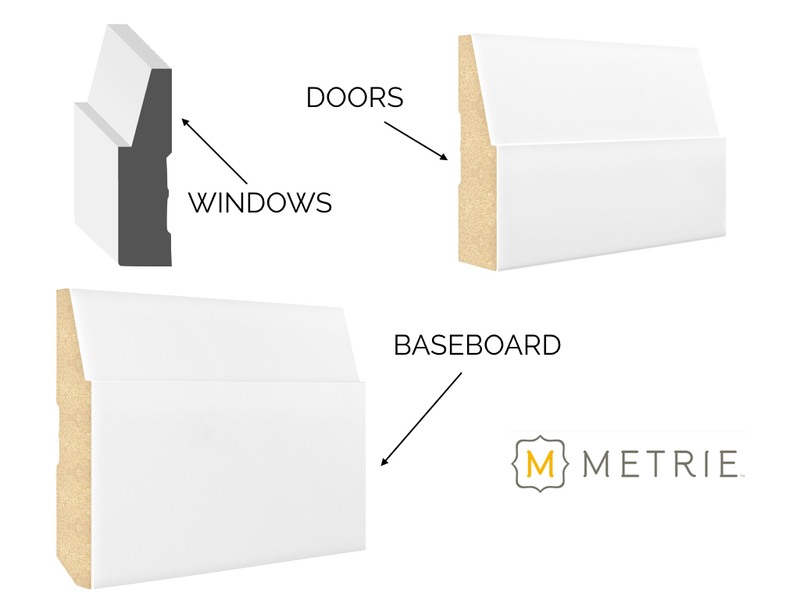 Metrie makes it exceptionally easy to find moulding and trim that works together. Just pick a collection and go! With the foundation set, it was time to focus on the decor. The reveal is still a few weeks away so I don't want to show you everything, but I'll share some of the pieces that you'll see in the room. How would I describe this look? Classic, neutral, and serene. Just what I was hoping for. I'll go in more detail about the design in the weeks to come. For now, head over to see progress from the other Featured Designers. Thank you to these wonderful sponsors who are helping bring this room to life.